A few feel good stories, to remind you how terrific this stuff is, I am loving seeing my team take ownership of this campaign and create different initiatives. The image above is on every screen in the school to remind us to “look for good”. Our Senior School Students are now using padlet to post positive detective images and links to share on an electronic pin up boards. 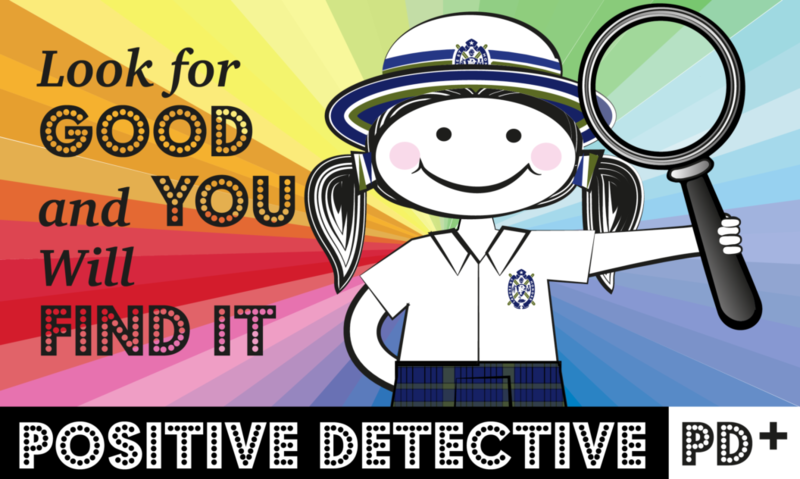 Our 11 and 12 WB & S Co, actually posted positive detective images along the stairs of the auditorium and then had all the parents at the parent evening share a positive detective moment from their day with the person sitting closest to them. Teachers bought a “Sherlock” dog and then let each student take it home that night and write in the Sherlock journal all the good things they did with Sherlock.